One of my ongoing kitchen goals has been to cook with different cuts of meat. With beef, there are two cuts that I’m very confident with cooking — ground beef (like in my favorite Meatballs, American Chop Suey, or Stuffed Peppers) + filet mignon, which is my go-to meal for special occasions. But, I’m trying to branch out more, experimenting with flank steak, skirt steak, short ribs, and more. 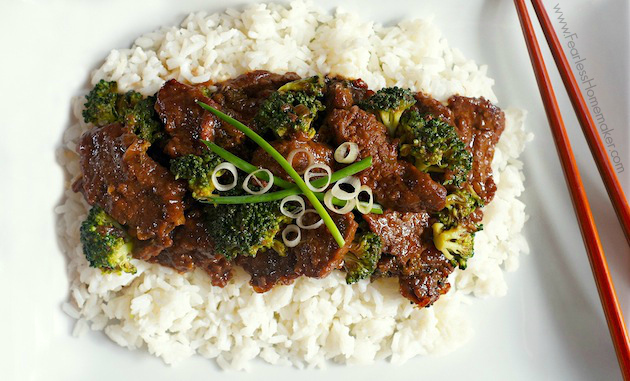 And this amazing Beef + Broccoli? Is my new favorite beef dish. Made with flank steak, it is super quick + easy to make (ready in less than 20 minutes total! ), and it is CRAZY delicious. First, you prepare a simple sauce, using soy sauce, chicken broth, ginger, garlic, honey, rice wine vinegar + a few other ingredients. Then, you thinly slice your flank steak, toss it with a little cornstarch + get it seared in a hot pan. Add in the broccoli + the prepared sauce + cook everything together for 5-10 minutes, until the broccoli is perfectly crisp-tender + the sauce is nicely thickened. The steak turns out wonderfully tender + packed full of flavor, despite its short cooking time. The sauce is a complex, beautiful blend of flavors – salty, sweet, bright, peppery, + just-a-little-spicy. Serve with white rice, lo mein, or spiralized vegetable “zoodles” + you have a perfect, scrumptious, simple weeknight meal ready in just a few minutes – what more could you want?! In a medium bowl, whisk together soy sauce, chicken broth, honey, rice wine vinegar, brown sugar, garlic, sesame oil, ginger, red pepper flakes and 1/4 cup water; set aside. In a separate medium bowl, toss together sliced steak and cornstarch until steak is lightly coated. Heat vegetable oil in a large skillet over medium-high heat. Add steak and cook, flipping once, until browned, about 4-5 minutes. Add in the broccoli and soy sauce mixture, and cook, stirring occasionally, until the broccoli is crisp-tender, and the sauce is slightly thickened, about 5-10 minutes. This sounds wonderful. I used to make a flank steak recipe like this, but yours sounds even better! I’d love to give it a try. Oh that does look FANTASTIC! My hubby loves beef & broccoli. This looks incredible, Amy! 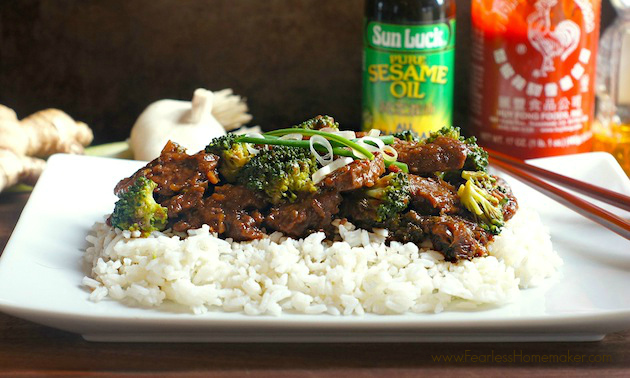 This is one of my husband’s favorite dishes and the flavors sound perfect! Love how tender and flavorful it looks! I never really branch out on cuts of beef, either! But this sounds SO YUMMY! Flank steak isn’t too intimidating so I need to try this!! I need more easy weeknight meals in my life. And slow cookers. Love that this is easier than ordering take out. I’m Asian and you’d think I would have this under my belt. But no…..I haven’t even attempted this at home. So good to see someone make Beef and Broccoli look so appetizing. Kudos! You are too sweet, Agness! This look so good! I need to branch out more with my dinner recipes and you’ve just inspired me to do so! Can’t believe how easy this one is too! ah this looks soooo good! I’m trying to branch out in cooking in general and this looks really fantastic. I will add it to my meal plans soon! I have never commented here before, but felt that I should to let you know how much we enjoyed this dish for dinner this week! I subbed sugar snap peas that I had on hand for the broccoli. My husband and toddler we both big fans of this meal. Thanks for the great recipe.